Apologies to all of our readers, as we definitely shut it down a bit during the Christmas break. I don’t anticipate posting much during the New Year’s break either, but I did want to weigh in on the one bit of Yankees news that happened while I was enjoying my no carbs/no sugar Holiday diet (I know… ridiculous). 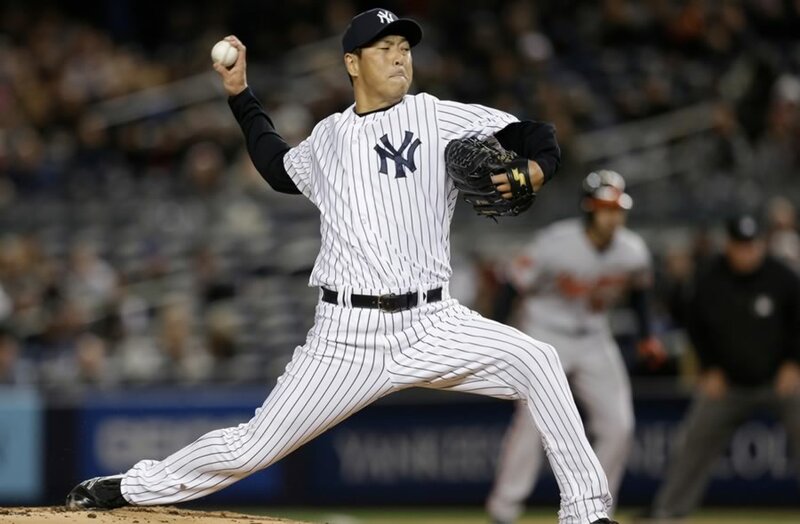 As most of you probably already know, Hiroki Kuroda, formerly of our beloved Bronx Bombers, has decided to return to his native Japan, signing with the Hiroshima Carp – the team he originally came up with – for his age 40 season. We’ll miss you, Hiroki. Let’s look back on a wonderful MLB career. Kuroda, of course, began his career in Japan, spending eleven seasons with the Carp after the team had drafted him in the second round of the 1996 NBPL draft. He made 244 starts (271 games overall) for Hiroshima, winning 103 games with a 3.69 ERA and a 1.265 WHIP. He was mostly a solid pitcher, and never truly spectacular (although his win total was hurt by a severe lack of run support), until the 2006 season. That year, he made 25 starts, won 13 games and put up a 1.85 ERA. That would be his penultimate season in Japan, because following the 2007 season, Kuroda decided to come to America, signing a three-year, $35.3 Million deal with the Los Angeles Dodgers. He immediately became one of the Dodgers’ most dependable starters. Over the next four seasons, he won 41 games for Los Angeles, losing 46 despite a very servicable 3.45 ERA (again, he was not very well supported by his offence). He helped the Dodgers to the playoffs in 2008 and 2009, but the team never made it pas the NLCS. Hiroki during his days representing the Japanese national team. The Yankees signed signed Kuroda on January 26th, 2012, the same day they traded for Michael Pineda from the Seattle Mariners, so that was a pretty memorable day for Yankees fans. Much like in Los Angeles, Kuroda became the Yankees’ most dependable starter over the next three years. While guys like CC Sabathia aged before our very eyes, and youngsters like Pineda spent most of their time on the disabled list, Kuroda made 97 starts during his time with the Yankees. He went 38-33 with a very respectable 3.44 ERA (He was, you guessed it, plagued by a lack of run support) during his time with the Yankees. I really can’t stress how wonderful it was to know that he was always going to take the ball every fifth day and give the Yankees a chance to win. Yes, he finished the 2012 and 2013 seasons with a bit of a swoon, and started 2014 with a similar ineffectiveness, but overall, he was truly awesome for us. We could not have asked for anything more from #HIROK. Although in my heart of hearts, I was hoping he would come back for one last year in pinstripes, I cannot blame the man for wanting to go back home. He has now been away from the NBPL, and presumably his family, for seven seaons. He doesn’t have too many years left of pitching, so it makes sense for him to sign back with the Carp. I’m sure he’ll get a hero’s welcome. We’ll miss you, Hiroki. Thanks for the last three awesome seasons.